After all the grief we gave The Rock And Roll Hall of Fame last year with our in-depth profile series, we thought we'd take a slightly different approach this time around. have been royally screwed by The Rock And Roll Hall Of Fame and any recognition paid their way at this stage of the game can only be construed as bittersweet and "better late than never".) In the earliest days of The British Invasion, The Dave Clark Five were the guys who gave The Beatles their most serious run for the money. Thanks to their songwriting talent and ability to continue to change and inspire, The Beatles perceviered ... but The Dave Clark Five still managed seventeen Top 40 Hits here in The States, where they were lovingly embraced, setting the record for the most appearances on The Ed Sullivan Show for any British Act with eighteen! They were loud and raucous (Glad All Over; Bits And Pieces; Do You Love Me; Any Way You Want It; Catch Us If You Can) ... they were soft and tender (Because; Come Home; Everybody Knows; Satisfied With You) and it didn't matter if they were revving up an old Chuck Berry number (ala Reelin' And Rockin') or putting their spin on an early '60's classic (like You Got What It Takes) or a Golden Oldie (like You Must Have Been A Beautiful Baby), The Dave Clark Five captured it all yet still made it their very own. I will never forget begging for ... and then receiving ... their Greatest Hits album for Christmas, 1965 ... I had never wanted an album so badly before ... and talk about HITS!!! There wasn't ANY filler on THIS disc!!! Their music hasn't been readily available for most of the past 25 years and that's a shame ... because classic tracks like these deserve to be played and heard and enjoyed. Congratulations to The Dave Clark Five on your induction into The Rock And Roll Hall Of Fame ... it's about time they noticed!!! - The band was considered the loudest UK group till the Who came along. In fact some ballroom owners did not allow them to perform "Bits & Pieces" because of the stomping damaged their wood floors. - They had a string of 17 top 40 hits from 1964 to 1967. They were pretty much neck and neck with the Beatles during those three years. - They helped steal the focus back to London from the Merseyside. - The band has sold over 50 million copies of their records worldwide. Now for something that is more subjective. The DC5 was fun, with that stomping drum beat, underlining saxophone. They were very adorable, with lead singer, Mike Smith and drummer, Dave Clark. They were a good solid pop group. I personally loved them. But I was a kid. I never met them nor worked with them. However, Ray Davies of the Kinks did. In his 'Unauthorized Autobiography', "X-Ray", he wrote about the 6 week tour back in March 1964. The Mojos opened the show (whose hit at the time was Everythings Alright), then the Kinks, then the Hollies. The show's headliners were the DC5, who closed the show. Ray wrote: "Dave Clark was a quiet north Londoner who had become amazingly successful, not so much because of his musicianship but because he had a shrewd head for business. He also had an astonishingly dark suntan for a musician touring England in the depths of winter, and his stage act was somehow presented with a kind of contrived machismo that proved to be timeless in the sense that it was both decades ahead and behind its time. The Dave Clark Five were definitely a product, and it was probably for this reason that Eric (Haydock, of the Hollies) had taken such a negative response to their act. They were also Number One in the charts with "Bits and Pieces", to which they insisted on doing a military-style goose-step every time they performed on stage. There was so much equipment and so many cables connected to their equipment that on several occasions the whole power supply would blow up, causing an embarrassing delay while the long-suffering electrician repaired the fault. After a while Dave Clark and his four chums started to suspect that it was sabotage, and one night after a show in Southampton Clark stopped the coach on the way back to London to hold an official inquiry. He threatened that when the saboteur was eventually caught, the offender would be summoned to his quarters where 'a punishment of the severest nature' would be implemented. 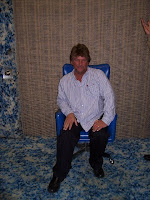 Graham Nash of the Hollies wondered if the sun-tanned drummer was showing signs of cracking. Mick Avory (Kinks' drummer) asked if Clark had been a boy scout, and if so, offered to help administer the punishment. Dave Davies (Ray's brother and Kinks' lead guitarist) swigged his beer and gave a V-sign, and Eric Haydock looked innocent and said nothing." Although the DC5 couldn't make it over the psychedelic, album orientated, mind-expanding musical time period like The Who, The Beatles, The Rolling Stones, and others did; they did provide a fun ride while it lasted. By the way, I found a very interesting report regarding Mike Smith's recovery from his very serious fall four years ago. So sad about the death of the DC5's Mike Smith. His voice will live forever. Mike Smith, the keyboard player and lead singer of the Dave Clark 5 died of pneumonia yesterday, ironically, less than two weeks away from being inducted into the Rock & Roll Hall Of Fame. Check out the comments at the end of this article, it will make you cry ... this man was DEEPLY loved and admired by all! And what a talent ... his voice was incredibly beautiful. I got a chance to see him perform in Denver about 4 years ago and he blew me away. I'll guarantee you, when the DC5 is inducted into the R&R Hall of Fame, there won't be a dry eye in the building! I am very saddened to hear of Mike Smith's death ... and right before their induction. Mike was the member of the DC5 I had a crush on! When I went to see them perform in Boston, I had made a "Gum wrapper chain" which was all the rage those days for Mike. I made it however tall he was, by folding tons of gum wrappers into some configuration. Right before the show, one of the ushers brought it up in an envelope with my name on it and announced to the crowd "Here is a gum chain for Mike from Eileen"! He let out a big "Whoop" from backstage!! I was so excited, and even more so on Monday when people in my school who had been at the concert were all talking about it. A happy day for sure. The Dave Clark 5 is in th Rock Hall and we can all reflect on what the music meant. At the time it meant nothing and by that I mean to say that it was like cool, sparkling tapwater in the summertime ... satisfying right down to your soul ... yet, we all assumed that there was an endless supply. That sound, that beat, those wailing vocals and screams. Surely they frame some moment of your childhood the way a brownie camera did. But it turns out there was a finite supply of those magnificent sounds, and thanks to an overprotective Dave Clark, you can't just go to Barnes and Noble and grab them ... making them seem more like insects preserved in amber. What these sounds represent is something most of us have lost ... namely, pure joy ... and that's exactly what every true fan should feel on this great occasion ... pure joy. The world lost a great person and a great singer when Mike Smith passed away recently. In my 39 years in broadcasting I have heard a lot of singers and he definitely was one of the best. I had the occasion just a few years ago to see Mike perform and was lucky enough to meet him after the show ------ a true, down-to-earth gentleman. He had a voice like no other. I hope Rolling Stone does him justice ----- I hope he is given the respect he is due ------ he truly had one of music's most powerful blue-eyed soul voices. I am a genuine fan, and to find out he was a really nice person was the frosting on the cake. Good singers are hard to find ------ you can buy a guitar and you can buy a set of drums but you can't buy a voice and Mike Smith had one of the best voices in Rock n' Roll, or any kind of music for that matter --- and his music and his voice will live on. I am really glad I got to see him perform ----- singing and greeting people all seemed so effortless for him. It seemed to me, I heard the Dave Clark Five performed more times on the Ed Sullivan Show than any other British Invasion group. How sad that Mike passed away just days, short of being inducted into the Rock n' Roll Hall of Fame. His last years I am sure were tough dealing with partial-paralysis since his accident ----- but I try to look at the bright side ----- now he doesn't have his body to hold him back. I would like to extend my condolences to his wife and family ------- I am sure they are devastated. What I noticed about Mike Smith when I met him was that he was so down-to-earth. Even though he was one of the best singers to ever hit Rock n' Roll, he didn't have an ego problem. He was as kind as could be. And when he stepped behind the keyboard and started singing it was pure dynamite ------- he definitely had a one powerful blue-eyed soul voice and his vocal range was astounding. From ballads such as "Because" to rockers such as "Reelin' n' Rockin" he could do it all. It's no surprise he powered the Dave Clark Five to so many hits. He left us a lot of great songs but the world lost a quality person. Mike, you will be sadly missed. Keep up your great work, Kent, it is greatly appreciated by us music-lovers. It is so great to have you present the stories behind the music from the people that were there. It gives it a whole different perspective. Thank-you again for all your work ---- it really is appreciated. Say a prayer for Mike Smith tonight. Tonight he is jamming with Elvis, Jimi, Janis, and out of the world of Rock N' Roll politics and into a better world. The Dave Clark Five were a great pop/rock band and I was saddened to learn of the death of Mike Smith. I was not personally aquainted with any of them but, being part of the 'British Invasion' myself with The Searchers & Petula Clark, I took a great interest in their remarkable success in the 60's. I still feel 'glad all over' when I think about DCF music. MIKE SMITH WAS AS COOL AS A ROCK & ROLL SINGER COULD BE! HE WAS ONE OF MY FAVORITES. HE WAS THE PERFECT VOICE FOR THE HUGE, DRIVING, BACKBEAT SOUND OF THE D.C.5. HE CARRIED HIMSELF WITH CLASS, DIGNITY & STYLE. I LOVED HIS VOICE AND HIS STYLE ... VASTLY UNDERRATED AND UNDERRESPECTED. THE SAD, RIDICULOUS PART OF THIS STORY IS THAT MIKE SMITH HE WAS KEPT OUT OF THE ROCK & ROLL HALL OF FAME, (WHILE HE WAS STILL ALIVE) BECAUSE OF SELFISH, PETTY, PETULANT, POLITICS. WHAT A SHAME. Criteria include the influence and significance of the artists contributions to the development and perpetuation of rock and roll. Nomination and induction into the Hall of Fame is not about popularity, records sales, which label the group is on, or anything other than the process below. The love for, the evaluation of, and the impact of any artist are subjective questions to be answered by the nominators and the voters. Unlike baseball, football, basketball or hockey, statistics are not relevant. The only formal criteria for the performance category is that an artist has to have had their first recording released 25 years ago. That said, candidates are reviewed and discussed relative to their impact on this music that we broadly call rock and roll. The innovation and influence of these artists is also critical. Gold records, number one hits, and million sellers are really not appropriate standards for evaluation. And therein lies my problem ... what exactly did Leonard Cohen do specifically to develop, perpetuate, innovate and / or influence the path of Rock And Roll??? And if you're going to cite him as a great songwriting talent whose material inspired and was interpretted by any number of artists over the years, then why is he being inducted into the Performer Category rather than the "influences" or "sideman" category? Perhaps his induction would be easier to accept were this the case. In an effort to help us determine that answer ... and because I promised you positive feedback and response on all of this year's candidates ... I now turn things over to Diana Parker (long-time Forgotten Hits List Member Vaguememory), a staunch Leonard Cohen supporter througout all my ranting raving, to better educate the rest of us who know so little of Leonard Cohen's "Rock and Roll" accomplishments. When it was announced that Leonard Cohen would be inducted into the Rock and Roll Hall of Fame this year, I felt proud. As someone who has long admired songwriters, it was, it seemed, a natural progression in the order of things. While Cohen is not your typical "confessional" singer-songwriter like James Taylor, Jackson Browne, Joni Mitchell, etc., his poet's soul shines thru in almost every song. His songs can be sardonic, romantic, idealistic, or any combination thereof. Maybe everyone had finally "caught on".I was exposed to Cohen's poetry as a teenager, and I was thrilled to find someone who could integrate issues like sexuality, politics, solitude, and religion (things we all wonder about as teenagers). I also found it interesting that Cohen could find the ugliness inherent in beauty and the beauty we all seem to miss in the most ordinary of things.It was not until several years after discovering his prose that I came across The Songs of Leonard Cohen (1968) at a garage sale and immediately grabbed it. I put it on my turntable and listened to it non-stop for the rest of the day. I fell in love with songs like "Suzanne", "Stories Of the Street", "Sisters Of Mercy", and "One of Us Cannot Be Wrong". The songs were at once elevated and mind-numbing, something alluded to by Oscar Wilde, "lying in the gutter, but looking up at the stars." I was inspired.Subsequent releases were sometimes disappointing because they weren't as start-to-finish perfect and dead-on as Songs Of, but I cannot say that I could not find something to love about each and every one. Songs like "Chelsea Hotel #2", "Everybody Knows", "Hallelujah", and "(Take) This Waltz" emerged as "classics" and were recorded by many other artists. In all, they say more than one thousand renditions of Cohen's songs have been recorded. This, alone, is ample recommendation for Cohen's induction. No question about it ... Hallelujah is a great song ... and I've felt that way for as long as I've known it. (We've heard it used as a strong, emotional tool in any number of movies now and, ironically one of the contestants actually performed this one ... to resounding applause ... on American Idol this past week!!! In fact, our daughter saw Jon Bon Jovi perform it in concert this past weekend, too!) It's a great song ... but again ... it ain't rock and roll ... and the versions that we're all familiar with (and praising here) are not by Leonard Cohen!!! If it's true that "over a thousand renditions of Cohen's songs have been recorded," then I certainly missed the boat on this one regarding his impact and importance to the music scene ... these credentials certainly should stand for something. Induction as a "sideman" or "influence", yes ... OK ... I'll buy it ... but as a performer who helped to shape and mold the next (or any) phase of Rock And Roll??? Sorry ... but but I'm just not gettin' it!!! As a kid growing up in Philadelphia, I was exposed to alot of new music, because of the Bandstand phenomenon going on in the early 60's. But, when I first saw The Ventures I didn't know what to make of them. They had cool Guitars,looked kinda cool ... but they didn't sing! I soon found out that the power of those guitars were every bit as strong as a vocalist ... and I was drawn in. My appreciation for The Ventures opened me up to artists like Davie Allan & The Arrows, and The Surfaris, both of who I have come to know personally, and who have had such a profound effect on me as a musician. I owe alot to The Ventures. They exposed me to a side of Guitar music that almost passed me by back then, and because of them I went back to listen to people like Chet Atkins, The Shadows,and many others. To say that The Ventures were and are Inspirational to me is an understatement. And "Walk,Don't Run" is forever a classic. Thank you Mr. Edwards, and congratulations to "The Ventures". Fate is fickle in that a happy and celebratory moment can be, at the same time, sad. The Ventures being inducted into the R&R Hall of Fame is long overdue. The group influenced the whole world of instrumental records and the John Barry Seven had a hit in the UK with our cover of their world wide hit, 'Walk Don't Run.' Also, saddened by the very recent loss of Mike Smith, the Dave Clark Five surely deserve this recognition and a place amongst the greats of the industry. I knew and worked with the DC5 and have nothing but respect for their work and, like the Ventures, their influence on pop music. Mike and I met just before his dreadful accident and talked about how exited he was with his past, present and future career. Let us all raise a glass to a gentleman, an inspiration and a great musician. I'd also like to point out that Kenny Gamble and Leon Huff, the guys responsible for "The Sound Of Philadelphia" are also being inducted into The Rock And Roll Hall Of Fame tomorrow night in The Non-Performer Category. These guys dominated both the pop and soul charts throughout the '70's, creating classics like Me And Mrs. Jones (by Billy Paul), Love Train and Back Stabbers (by The O'Jays), If You Don't Know Me By Now and The Love I Lost (by Harold Melvin and the Bluenotes) and When Will I See You Again (by The Three Degrees.) They were responsible for writing great late '60's classics like Cowboys To Girls (by The Intruders), Expressway To Your Heart (by The Soul Survivors), I'm Gonna Make You Love Me (by Diana Ross and the Supremes and The Temptations) and A Brand New Me (by Dusty Springfield.) 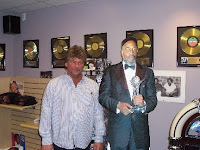 Frannie and I had the pleasure of touring their studio (thanks to our gracious Philly Tour Guides, Rich and Mamie) when we flew out to the East Coast last November ... heck I even had my picture taken with a cardboard cut-out of Kenny Gamble and sat in a chair in the same studio where Me And Mrs. Jones was written! 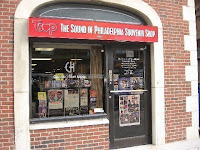 Congratulations to Gamble and Huff ... you guys ARE "The Sound of Philadelphia"!!! Anyway, Congratulations again to ALL of this year's Inductees ... can't wait to see the VH1 Broadcast ... should be QUITE the show this year!! !